Factoid: NHTPC is the ‘first in the nation’ for state tea parties as it formed the first ‘statewide’ tea party coalition sometime before April 15, 2009. We were also participants in the first tea party on December 16, 2007, which Rick Santelli later referred to in that famous rant when he said he would do the same at Lake Michigan. We do not receive funding from anyone. From NH to Santa Monica, CA., people ‘tea partied’ with yellow flags and fife and drum corps. So you can see that the tea party is now coming up on its 5th birthday in December of 2012! We are not affiliated with any ‘national’ group that started up in 2009, and any money you send to them does not benefit any state or local group, even if your group agrees to call themselves an affiliate. We are a movement, mainly about issues, and will continue to work on a volunteer basis, within the state of NH. No one in DC speaks for us. If you are not getting the eblast, which has been sent out weekly without fail for over a year now, simply call the CNHT office at 471.0138 between 9AM-5PM, M-F and see what’s up with it. This page will be updated from time to time depending on what misinformation is spread by the various newspapers. We do not speak to the press so this page is the only source of correct facts about our movement. We are not affiliated with any media outlet, political party, lobbyist group, astroturf group, or national group calling itself a ‘tea party’. What you read in the papers is mostly misinformation. The GOP has not asked to absorb us, nor have we asked for them to absorb us. Our relationship with all political parties is cordial but separate. We would never join a group that has hijacked the tea party name, while supporting illegal immigration. We are unique to NH and consist of NH groups who support our philosophy of limited government and constitutionality. Their listing is not necessarily indicative of any administrative or monetary input. We receive no funding from any source. We do not raise money or endorse candidates although some candidates may choose to speak to people at our events. Our sole purpose is to educate and organize. If you would like to donate to a group that does do fundraising, please consider one of the groups listed on the right who are set up for that. They have likely been engaged in the daily fight in NH for a long time, and would very much appreciate your contribution. REPORTERS: Please do not bother any of our members or member groups. They are NOT authorized to speak for the group. The group has no ‘head’. Most of the information you are looking for can be found on this page. Once again, we have nothing to do with the ‘convention’ that is supposedly being put on by some other group in another state. If you already signed up at the April 15th 2009 or 2010 Tea Party in Manchester where we were 4,000 strong, there is no need to sign up again, unless you are not getting messages for some reason. Note: AOL, NetZero, and JUNO users — your ISP is notorious for bouncing emails. Fairpoint is now also affected. If you still wish to get our messages, please use a reliable ISP. If you believe that government is out of control and that it should not be taking over private businesses, bailing out banks, taxing ‘carbon’ for a global purpose, or controlling us via our health care, the food supply, or bodies of water, and should investigate the fed reserve, then you are with us. You can read about the history of the new tea party movement here. Unlike the far left progressives who pay their ‘volunteers’ with outside money (SEIU, ACORN, NHDP, HCAN, OFA, etc), we are all volunteers. We simply believe that our country is undergoing the most egregious socialist takeover in history and it MUST STOP. Recently we read a comment from someone who stated that since the tea parties were funded by Freedom Works, the tea parties would go away just as soon as the funding dried up. This was quite amusing. We get no funding from FW or anyone. We do not have paid staff. Our work is done totally by volunteers. Note: We got some email asking why we did not advertise ‘the bus’. In case you wonder why we’re not affiliated these folks are making millions off of our name. 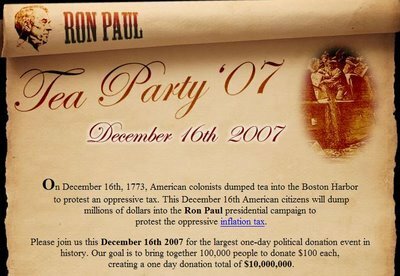 Remember the tea party started on December 16, 2007 with Ron Paul supporters who tossed crates of tea into harbors all across the USA, then gathered on the lawns in DC on July 12, 2008, about 10,000 strong. Because of Paul’s connections to people like Peter Schiff and Rick Santelli who work in the financial sector, Santelli went on his ‘rant’ on TV, stating that he was so upset with the flailing market that even he too would stage a tea party at Lake Michigan, ostensibly to do what we had done in December of 2007. And thus is how the concept caught on to the general public. There is nothing required of groups to become ‘members’ other than supporting the tea party goals and principles and to be vetted by the other groups. There is nothing required of members who sign up for the eblast other than we ask you to spread the word, get educated, get active, and don’t give up. 1) The Coalition was formed to demonstrate the wide support for the tea party ‘movement’ from a number of NH groups of all types. (About 50) There are no anointed leaders or job titles. Every group has its own rules and functions on its own as it would. Their membership in this Coalition merely shows support for the general movement. We are not affiliates of any of the so-called national groups that have sprung up after the fact, and we do not get funding from them or anyone.